Midway through a recent job interview, the candidate began discussing his political opinions. Whether we ardently disagree with his opinion—and his job candidacy had already soured for other reasons—we were startled by the impropriety of his political discussion in a work setting. Especially in an interview situation, his lack of judgment sent a clear message to us about his common sense and his ability to help lead the organization. Polarizing employees who felt discussing politics in the workplace would be inconsistent with our cultural norms. Not satisfied with his initial sally into no man's politics land, he went on to tell us how he had recently voted and about the political bumper stickers he had seen in the company parking lot. At this point, the interview turned into a casual chat until we ushered him out of the office. We don’t care who he supports in his politics, but political discussion is normally unwise in any work setting. This candidate failed to exercise good judgment as he spouted his political views during a job interview, of all places. In a workplace that honors diversity, every person’s politics, religious beliefs, sexual activities, and opinions about non-work issues should, for the most part, stay home. Unless you work in a setting that is dependent on a particular set of beliefs, such as a Republican Party field office, an environmental lobby group or a church, you risk much more than you can hope to gain when you raise sensitive issues at work. At best, you risk offending coworkers whose help you need to accomplish work. In the worst case scenario, you may create a hostile work environment and potential long-term hard feelings among coworkers. As a manager or supervisor, if you become aware of political or another discussion, ribbing or name calling, you need to deal with it as you would any other potentially negative situation that can escalate into conflict among people. Don’t ignore the political discussion. It won’t stop on its own and will likely escalate unless you give staff members a friendly reminder. Recognize that you walk a fine line between allowing your employees freedom of expression and managing a potential source of conflict. Casual discussion during the work day, when it does not interfere with work, is crucial for developing work relationships. Positive work relationships are essential for positive employee morale and employee retention. In fact, having a best friend at work, according to research by the Gallup organization, is essential for retention. Communicate the difference between expressing personal beliefs—which should be acceptable, although often unwise at work – and attacking the beliefs of others – which is not acceptable. You can handle most situations on a case by case basis with your adult employees. In some workplaces, you may want to consider the adoption of a policy that bans the display of political, religious and other articles, slogans or objects that could potentially create conflict among your employees. Proponents of this type of policy believe the employer has an obligation to control sources of conflict at work. Make sure that your harassment policies and harassment complaint system are posted and that employees are trained in the process. Use progressive discipline if an employee repeatedly attacks or scorns political, religious or other deeply held beliefs of coworkers. Provide respect and dignity behavioral training to all employees and emphasize respect for different ideas, beliefs, and needs. Make sure your Code of Conduct clearly spells out the need to honor diverse opinions, beliefs, values, and goals. Freedom of expression is good in the workplace, especially if you want a workplace environment that honors diversity, seeks divergent ideas, allows room for respectful disagreement and fosters continuous improvement. These are all signs of a healthy, employee-supportive work environment. 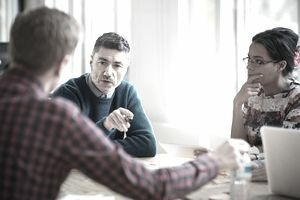 Watch to make sure, however, that the discussion of politics, religion, and differing beliefs does not escalate into workplace conflict and hurt feelings.